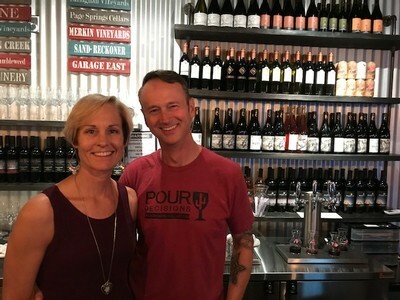 Owners Pete and Jeanne Snell are uniquely qualified to create, foster and deliver an outstanding customer experience to the guests of Arizona Wine Collective. The Snells' extensive background includes public relations, marketing, advertising and retail. Most importantly, they love exploring the world of wine. They’ve made it a hobby of tasting wines wherever they travel – from Tennessee to Victoria B.C., as well as many trips to more traditional areas of Washington, California, Oregon and Italy. Exploring wine was a get-away from the intense 12 years of starting and running a successful retail operation. In fact, under the ownership of Pete and Jeanne, their running stores were recognized as one of the “Top 50 Running Stores in America” nine years in a row for their outstanding customer service, presentation and vendor standing by a national, independent organization. With fierce local and online competition, the Snell’s were not only able to succeed, but prosper by consistently delivering a memorable and valuable experience to their customers that fostered deep loyalty. Truly discovering the wonderful wines of Arizona came after selling their running stores in 2016. Pete went to work at the Callaghan Vineyard and Winery in Elgin to better understand the business of making and selling Arizona wine. Kent Callaghan, who started his winery in 1990, is the longest running wine maker and leading authority on wine production in the state. And, Kent’s wines are the most decorated in the state. Arizona Wine Collective was born out of our years of retail experience, our hobby of wine tasting and exploration and our dedication to creating an outstanding local business that highlights Arizona-made products. We invite you to come in, experience Arizona wine and share in our passion for the work being done by amazing winemakers in our own back yard.